Somali people are very concerned about the Ethiopian occupation in their territory, Waagacusub Media, an Investigative news outlet, has obtained that at least six Ethiopian Generals freely operate in Hargeisa, Garowe, Kismayo, Dhusamareeb, Baydhabo, and Mogadishu. The Generals have their own staffers that established a network of spies and other institutions. Over the last couple of years, they have been operating as informants , however, their working hours extended and there is no clear consensus about their secret operations and most of it is hidden from both the local people and established administrations in Somalia. However, experts say that the Ethiopian Generals' work samples the one that the former Somalia's colonial rule of Europe mainly Italy and British had in Somalia late 20th century. They control Somalia's political system, infiltrate clans, intimidate patriots, monitor the Somali media, gather intelligence and dictate ministers and every politician in Somalia except few. General Gebre Head, who committed widespread human rights violations during his invasion of Mogadishu in 2006, based in Somalia Presidential palace known as Villa Somalia. He chews Khat, popular drug and his Ethiopian flag is hoisted inside the Villa Somalia as a sign of Embassy. General Gabre's spies collected information from government institutions including the cabinet, Somali military and Police as well as the Somalia's National Intelligence and Security Agency NISA passes to Tedros Adhanom Gebreyesus. His assigned areas are Mogadishu, Middle Shabelle, and Hiraan Provinces. General Berhu Tesfaye, operates in Hargeisa and he has more Somali informants that receive his orders. Telephone calls are being revealed to him by the Somali telecommunication services in Hargeisa. General Abraham Alemu , operates in Garowe and he allegedly has more Somali Speaking spies that work in Puntland. 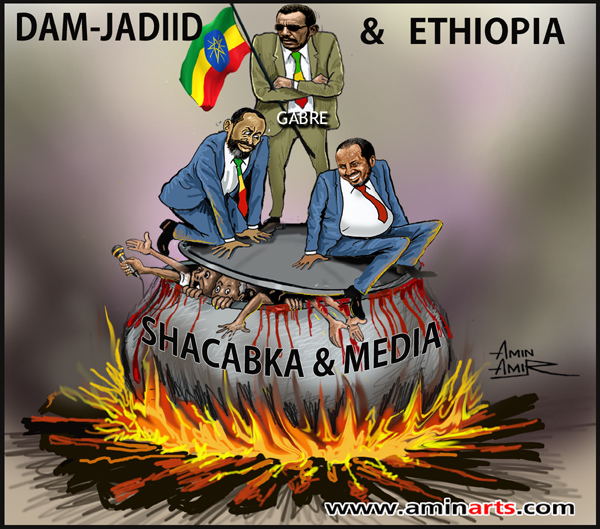 They always spy on civilians from Ogaden region to control their movements. General Abraham Alemu ordered Dahabshiil owned SOMTEL Communication Company to shut down an ONLF-run website: Ogaden News Agency or Ogadennet.com. He conducted several operations that were assassinated alleged ONLF-Sympathizers. General Gebresilasia Mokane, operates in the Central regions in Somalia he is based in Dhusamareeb. He commanded the killing of many civilians near the border of Somalia. General Gebemedin Fekedu, operates in Bay, Bakol and lower Shabelle, he based in Badiabo. General Gere Alemseged , operates in Jubaland area and he based in the port-city of Kismayo. 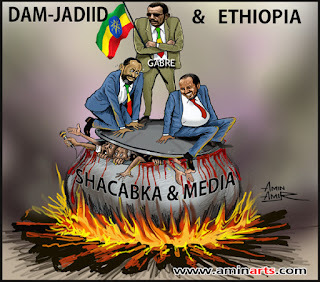 The Ethiopian generals use divide and rule policy in Somalia and they sometimes claim that they stand the interest of the clan that they are addressing each time. Several Somali PMs declared that the Somali nation is under the control of new imperialists on air.